All that’s left is the rubber stamp. 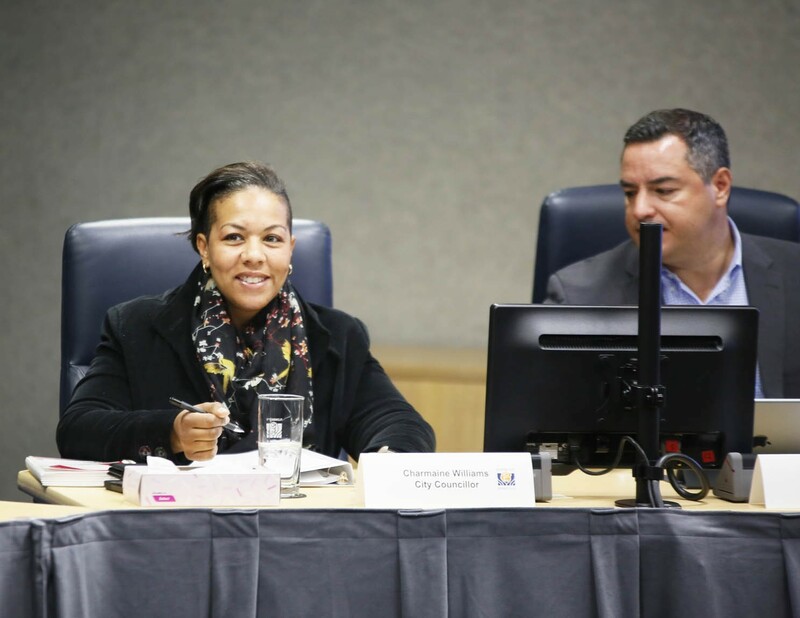 Brampton City Council wrapped up budget deliberations for the 2019 budget on March 25, leaving only Wednesday’s special meeting to give the budget final approval. Through a series of budget tweaks, Mayor Patrick Brown managed to get his promised tax freeze for the coming year. Earlier this month, city staff delivered a proposed operating and capital budget that would have bumped Brampton’s portion of residents’ tax bills by 0.8 percent, the smallest increase in nearly 20 years. From the start, Brown declared that wasn’t good enough and urged councillors to “sharpen their pencils” as they went into discussion on the details of the $713-million operating budget and $383.8-million capital budget. Initially, the pressure appeared to be pushing Brampton further away from Brown’s campaign pledge to keep taxes frozen for the coming year, as a number of walk-on amendments during deliberations came with associated extra costs. City staff's initial proposal called for a 0.8 percent tax increase on the city's portion of the bill. For example, a reduced-fare transit pass for seniors was supported by several councillors. Councillor Gurpreet Dhillon noted he “heard loud and clear” at the doors during his fall election campaign that reduced fares were needed for Brampton’s older population. To swallow the cost of a reduced fare, expected to be between $400,000 and $450,000, without placing further burdens on taxpayers, council reached into reserves to the tune of $110,000—enough to subsidize a reduced senior fare of $15 a month. Other transit fares will see slight increases. A motion from Councillor Charmaine Williams sought to provide a monetary incentive for Brampton residents to participate in the Peel Regional Police Gun Amnesty program. The initiative was created to get unwanted guns and ammunition off the street through a turn-in program. The motion wasn’t addressed during budget deliberations, but a report going before councillors ahead of Wednesday’s special meeting notes that a one-time amount of $5,000 could be set aside in this year’s budget to accommodate a $100-per-firearm incentive. These tweaks kept the proposed increase at 0.8 percent, but councillors still needed to find areas to trim or defer to eliminate the tax hike altogether. First, they agreed to spread certain salary increases totalling $1.2 million over two years rather than pay them out fully in 2019. Changes to the minimum wage law last year resulted in some low-level City employees earning the same or more than their supervisors, prompting the City to hike higher position salaries. But instead of making those “compression impact” adjustments all at once, the city is spreading out the pay hike over two years, saving $1.2 million in 2019. Additionally, $1.07 million in work needed to convert the Riverstone Golf Course to a community centre has been deferred until 2020, to align with the centre’s anticipated opening. Medeiros noted that the fiscally conservative stance of council will rub off on future budgets, and suggested residents should not be overly worried about “sticker shock” or costs building up down the road. However, the budget document suggests that a pileup of deferred projects is definitely looming in the years ahead. Aside from the growing infrastructure deficit, which currently sits at $246 million (and is expected to grow to $743 million by 2027), the city will also need to figure out how to pay for several big-ticket items that, save for much more significant support from upper levels of government, will need to be covered by the property taxpayers or push the city deeper into debt. Essential upcoming work includes a new $162-million transit maintenance facility and a 16 percent increase in the city’s bus fleet over the next three years. A new $5.4-million fire station is planned in the northwest sector, along with a new Centre for Innovation and Connected Learning in the city centre. The latter recently received a boost from Brampton’s federal partners, who announced a one-time “top-up” of municipal infrastructure funding through the doubling of gas tax contributions. That measure was announced as part of the Liberal government’s 2019 budget. The top-up gives Brampton an additional $16.6 million in gas tax funding, bringing the city’s total allocation to approximately $50 million. The boost in infrastructure funding gives council the capacity to not only pay for projects previously reliant on property-tax funding, but also reduces the city’s debt requirements. As for the envisioned Centre for Innovation and Connected Learning, the city previously planned to issue $80 million in debt to pay for the facility. But the additional gas tax dollars will mean that loan can be reduced by $30.6 million, saving the City $1.77 million in servicing that debt for 2019. This additional capacity offers a small breath of fresh air. The City will still need to borrow $52 million in 2020 to pay its share for constructing the transit maintenance facility and a further $31.4 million in 2021 to pay for delayed Downtown Reimagined streetscape improvements. Despite these savings, there are many uncertainties in Brampton’s financial future. 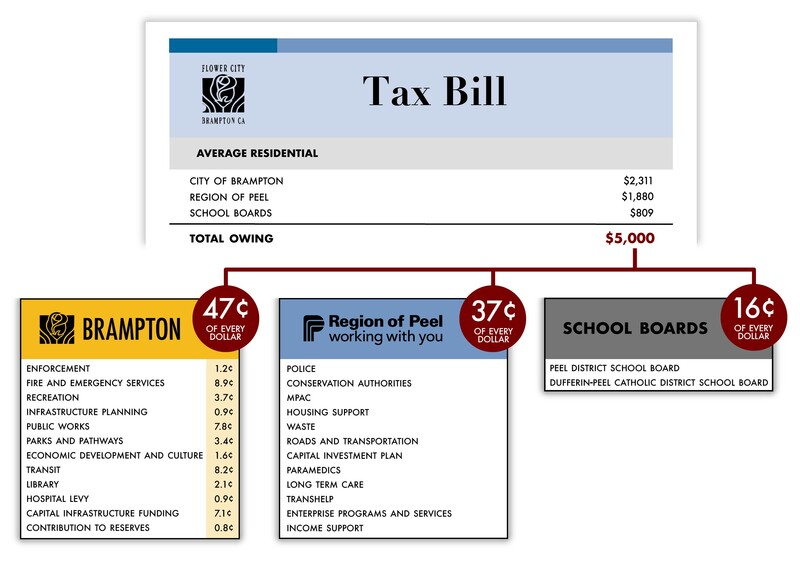 A glimpse at where Brampton's tax dollars end up and what they're used for. The budget document approved in 2018, which tentatively approved budget figures for this year and 2020, suggested the City would need a 5.4 percent tax hike for 2019, based on services the city needs to provide and the repairs and maintenance needed to keep assets — community centres, roads, libraries, parks, buses, etc.— in a good state of repair. Certainly, some of these things will get done despite the tax freeze, but not all of them. This means some important projects simply get pushed down the line. These deferred costs are already visible in this year’s budget document, which projects the City will need to hike taxes by 4.9 percent next year rather than the 4.6 percent that had been anticipated last year, and by 4.5 percent the year after. According to the city’s long-term financial strategy, Brampton should be able to maintain “modest” tax increases of between 3 and 5 percent with current revenue levels. These estimates include the 2 percent infrastructure levy the city has had in place for a while, but not the 1 percent dedicated transit levy proposed this year, which is proposed to rise by the same amount next year and the year after. 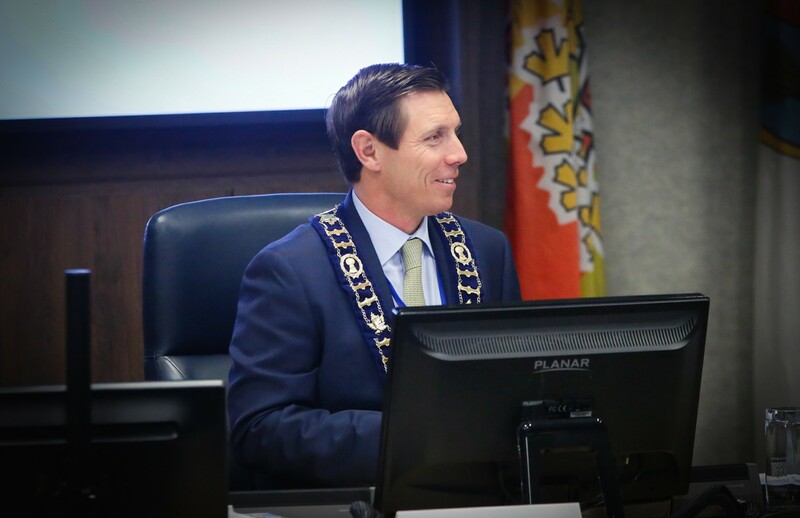 Brampton’s current council isn’t putting much stake in long-range tax projections and approved a motion to scrap them in any future city communications. “We know that they will not be the tax increases that city council will accept,” Brown said, arguing that outdated projections hurt the city’s economic development potential. Investors looking for a place to set up shop will come across dire tax projections in their due diligence research, Brown says, and even a hint of future increases could scare them off. “It completely diminishes our ability, it takes the wind out of our efforts on economic development,” he said. Brown is convinced the tax freeze will bring a ripple of positive effects for Brampton when it comes to attracting economic development. Brampton’s tax freeze, enacted while surrounding municipalities are approving hikes, will help the city play “catch up” and get back on a level that makes it a viable option for business investment, he argues. Overall, with city taxes paired with Peel Region and education taxes, the average Brampton property owner will be looking at an increase of less than $70 on the tax bill. Brown’s vision to keep tax increases lower for the foreseeable future could get a boost from an ongoing value-for-money audit being conducted by KPMG. Brown has said the audit is looking at all aspects of City operations to seek areas where savings are possible. The original target of March 6 for the completed audit has been pushed to May 15, long after budget decisions must be made.